It was a perfect evening. There was a palpable glow on the faces of my students. They were the faces of students who had been given something they didn’t know they had. The faces that say, “I did it…I delivered and I rocked!” The sense that they left the confines of their world and did something special…they accomplished something bigger than themselves. They shone as individuals. They lit up the room. While the Leafs and the Jays played, our students spoke. They spoke of the injustice, of hate, of isolation with the fresh eyes and raw passion that only youth can deliver. Students from four schools speaking about things that touched them the most, issues that moved them. The "Stand Up, Speak Out" night put on by Facing History Toronto last month illustrated the power of youth and the spoken word. The night was a culmination of weeks of practice and mentoring by inspiring spoken word artists like Testament, Lishai Peel, and Shoolie. When they took to the stage and spoke their pieces, an auditorium of snapping fingers and applause rewarded them. Parents were proud, if not bewildered by the depth of their child’s thoughts and the weight of their words. Facing History’s “dynamic duo” Jasmine Wong and Leora Schaefer coordinated this event, its lead up, and the reception that followed. These two amazing educators created a seamless evening that left the audience inspired. At the reception, our students met Nate Leipciger, a survivor of the Auschwitz concentration camp. When I told Ben, one of Waterdown’s student presenters that evening, he decided to introduce himself. Ben went over to pay his respects. When he returned from speaking with Mr. Leipciger, he couldn’t believe what he had told him. “That man survived the Holocaust and he said I inspired him,” Ben said. When it was time to go, my students seemed to want to linger just a moment more. They were relieved and proud. They boarded the bus glowing and triumphant. The tests they will study for and the notes they take will pass into history. But this night will stay with them always. For what is education if not to give our young people a voice? Find out more about the "Stand Up, Speak Out" project. 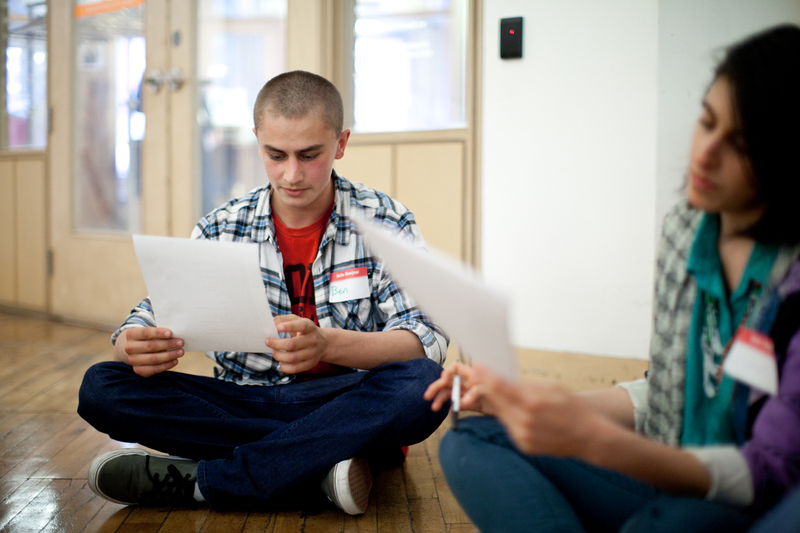 Bring it to your classroom: Five Facing History Resources That Use Poetry to Build Skills.